Peter Sloterdijk (German: ; born June 26, 1947) is a German philosopher, cultural theorist, television host and columnist. He is a professor of philosophy and media theory at the University of Art and Design Karlsruhe. He co-hosted the German show Im Glashaus: Das Philosophische Quartett from 2002 until 2012. Sloterdijk's father is Dutch. He studied philosophy, German studies and history at the University of Munich and the University of Hamburg from 1968 to 1974. In 1975 he received his Ph.D. from the University of Hamburg. In the 1980s he worked as a freelance writer, and published his Kritik der zynischen Vernunft in 1983. He has since published a number of philosophical works acclaimed in Germany. In 2001 he was named chancellor of the University of Art and Design Karlsruhe, part of the Center for Art and Media Karlsruhe. In 2002 he began to co-host Im Glashaus: Das Philosophische Quartett ("In the Glass House: The Philosophical Quartet"), a show on the German ZDF television channel devoted to discussing key contemporary issues in-depth. Sloterdijk rejects the existence of dualisms—body and soul, subject and object, culture and nature, etc.—since their interactions, "spaces of coexistence", and common technological advancement create hybrid realities. Sloterdijk's ideas are sometimes referred to as posthumanism, and seek to integrate different components that have been, in his opinion, erroneously considered detached from each other. Consequently, he proposes the creation of an "ontological constitution" that would incorporate all beings—humans, animals, plants, and machines. Like Nietzsche, Sloterdijk remains convinced that contemporary philosophers have to think dangerously and let themselves be 'kidnapped' by contemporary 'hyper-complexities': they must forsake our present humanist and nationalist world for a wider horizon at once ecological and global. Sloterdijk's philosophical style strikes a balance between the firm academicism of a scholarly professor and a certain sense of anti-academicism (witness his ongoing interest in the ideas of Osho, of whom he became a disciple in the late seventies). Taking a sociological stance, Andreas Dorschel sees Sloterdijk's timely innovation at the beginning of the 21st century in having introduced the principles of celebrity into philosophy. Sloterdijk himself, viewing exaggeration to be required in order to catch attention, describes the way he presents his ideas as "hyperbolic" (hyperbolisch). The Kritik der zynischen Vernunft, published by Suhrkamp in 1983 (and in English as Critique of Cynical Reason, 1988), became the best-selling work on philosophy in the German language since the Second World War and launched Sloterdijk's career as an author. Spheres is about "spaces of coexistence", spaces commonly overlooked or taken for granted that conceal information crucial to developing an understanding of the human. The exploration of these spheres begins with the basic difference between mammals and other animals: the biological and utopian comfort of the mother's womb, which humans try to recreate through science, ideology, and religion. From these microspheres (ontological relations such as fetus-placenta) to macrospheres (macro-uteri such as nations or states), Sloterdijk analyzes spheres where humans try but fail to dwell and traces a connection between vital crisis (e.g., emptiness and narcissistic detachment) and crises created when a sphere shatters. Sloterdijk has said that the first paragraphs of Spheres are "the book that Heidegger should have written", a companion volume to Being and Time, namely, "Being and Space". He was referring to his initial exploration of the idea of Dasein, which is then taken further as Sloterdijk distances himself from Heidegger's positions. Sloterdijk also argues that the current concept of globalization lacks historical perspective. In his view it is merely the third wave in a process of overcoming distances (the first wave being the metaphysical globalization of the Greek cosmology and the second the nautical globalization of the 15th century). The difference for Sloterdijk is that, while the second wave created cosmopolitanism, the third is creating a global provincialism. Sloterdijk's sketch of a philosophical history of globalization can be found in Im Weltinnenraum des Kapitals (2005), subtitled "Die letzte Kugel" ("The final sphere"). Shortly after Sloterdijk conducted a symposium on philosophy and Heidegger, he stirred up controversy with his essay "Regeln für den Menschenpark" ("Rules for the Human Park"). In this text, Sloterdijk regards cultures and civilizations as "anthropogenic hothouses," installations for the cultivation of human beings; just as we have established wildlife preserves to protect certain animal species, so too ought we to adopt more deliberate policies to ensure the survival of Aristotle's zoon politikon. The core of the controversy was not only Sloterdijk's ideas but also his use of the German words Züchtung ("breeding", "cultivation") and Selektion ("selection"). Sloterdijk rejected the accusation of Nazism, which he considered alien to his historical context. Still, the paper started a controversy in which Sloterdijk was strongly criticized, both for his alleged usage of a fascist rhetoric to promote Plato's vision of a government with absolute control over the population, and for committing a non-normative, simplistic reduction of the bioethical issue itself. This second criticism was based on the vagueness of Sloterdijk's position on how exactly society would be affected by developments in genetic science. 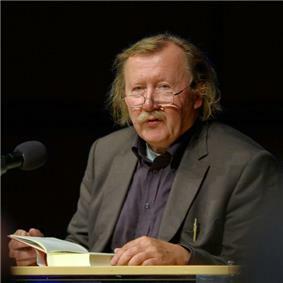 After the controversy multiplied positions both for and against him, Die Zeit published an open letter from Sloterdijk to Habermas in which he vehemently accused Habermas of "criticizing behind his back" and espousing a view of humanism that Sloterdijk had declared dead. Another dispute emerged after Sloterdijk's article "Die Revolution der gebenden Hand" (June 13, 2009; transl. "The revolution of the giving hand")  in the Frankfurter Allgemeine, one of Germany’s most widely read newspapers. There Sloterdijk claimed that the national welfare state is a "fiscal kleptocracy" that had transformed the country into a "swamp of resentment" and degraded its citizens into "mystified subjects of tax law". Sloterdijk opened the text with the famous quote of leftist critics of capitalism (made famous in the 19th century by Proudhon in his "What Is Property?") "Property is theft", stating, however, that it is nowadays the modern state that is the biggest taker. "We are living in a fiscal grabbing semi-socialism - and nobody calls for a fiscal civil war." He repeated his statements and stirred up the debate in his articles titled "Kleptokratie des Staates" (transl. "Kleptocracy of the state") and "Aufbruch der Leistungsträger" (transl. "Uprising of the performers") in the German monthly Cicero - Magazin für politische Kultur. According to Sloterdijk, the institutions of the welfare state lend themselves to a system that privileges the marginalized, but relies, unsustainably, on the class of citizens who are materially successful. Sloterdijk's provocative recommendation was that income taxes should be deeply reduced, the difference being made up by donations from the rich in a system that would reward higher givers with social status. Achievers would be praised for their generosity, rather than being made to feel guilty for their success, or resentful of society's dependence on them. In January 2010, an English translation was published, titled "A Grasping Hand - The modern democratic state pillages its productive citizens", in Forbes  and in the Winter 2010 issue of City Journal. Sloterdijk's 2010 book, Die nehmende Hand und die gebende Seite, contains the texts that triggered the 2009-2010 welfare state dispute. Scheintod im Denken - Von Philosophie und Wissenschaft als Übung, Frankfurt am Main (Suhrkamp), 1995. Im selben Boot - Versuch über die Hyperpolitik, Frankfurt am Main (Suhrkamp), 1995. ^ Michael Kempe, 'Neulich im Menschenpark: Die phantastische Anthropologie des Peter Sloterdijk', in Bernhard Kleeberg et alii (eds. ), Die List der Gene: Stratageme eines neuen Menschen (Tübingen: Gunter Narr, 2001), pp. 151—170, specifically pp. 162—164. ^ Holger von Dobeneck, Das Sloterdijk-Alphabet: Eine lexikalische Einführung in seinen Ideenkosmos, 2nd. ed. (Würzburg: Königshausen & Neumann, 2006), p. 10. ^ See Stefan Lorenz Sorgner, "Critique of Cynical Reason"In Search of Lost Cheekiness. An Introduction to Peter Sloterdijk's , in Tabula Rasa, 2003. ^ In more recent years, a deepening of this take on Heidegger's thought is given expression through a focus on the primordiality of space over time in fundamental ontology as articulated in numerous studies by the British-Lebanese philosopher and architect Nader El-Bizri in his investigation of "the place of being", of "dwelling", and primarily of Khôra. ^ See Frank Mewes, "Regulations for the Human Park: On Peter Sloterdijk's Regeln für den Menschenpark", in Gnosis, Volume VI, No. 1, 2002. ^ "Anger as philosopher revives vocabulary of Third Reich"
^ Peter Sloterdijk "Die Revolution der gebenden Hand"
^ "Die Revolution der gebenden Hand - Peter Sloterdijk „belehrt“ Marx eines Richtigeren"
^ "Wo bleibt der Bürgerkrieg?" ^ "Peter Sloterdijk rebelliert gegen den "Zwangssteuerstaat" - Blasen zu Phrasen"
^ "Germany's welfare state under fire - One of Germany's foremost public intellectuals, Peter Sloterdijk, began the offensive on the welfare state"
^ "A Grasping Hand - The modern democratic state pillages its productive citizens"
^ "The Grasping Hand-The modern democratic state pillages its productive citizens"
^ "Reply to a parliamentary question" (pdf) (in German). p. 521. Retrieved 11 December 2012. Europe’s Times and Unknown Waters, Cluj-Napoca, Braşoveanu, Narcisa (April 2009). "The Narcissistic and the Cynical Attitudes - Two Identitary Masks, Gilles Lipovetsky, L'ère du vide. Essais sur l'individualisme contemporain and Peter Sloterdijk, Kritik der zynischen Vernunft"
Michel Weber, "The Art of Philosophy—Critical review," Cosmos and History: The Journal of Natural and Social Philosophy, vol. 10, no. 2, 2014, pp. 327-333.